Ahab told Jezebel all that Elijah had done, and how he had killed all the prophets with the sword. 2 Then Jezebel sent a messenger to Elijah, saying, “So may the gods do to me, and more also, if I do not make your life like the life of one of them by this time tomorrow.” 3 Then he was afraid; he got up and fled for his life, and came to Beer-sheba, which belongs to Judah; he left his servant there. 4 But he himself went a day’s journey into the wilderness, and came and sat down under a solitary broom tree. He asked that he might die: “It is enough; now, O Lord, take away my life, for I am no better than my ancestors.” 5 Then he lay down under the broom tree and fell asleep. Suddenly an angel touched him and said to him, “Get up and eat.” 6 He looked, and there at his head was a cake baked on hot stones, and a jar of water. He ate and drank, and lay down again. 7 The angel of the Lord came a second time, touched him, and said, “Get up and eat, otherwise the journey will be too much for you.” 8 He got up, and ate and drank; then he went in the strength of that food forty days and forty nights to Horeb the mount of God. According to the World Nap Organization – yes there is such a thing – nearly 40% of nappers feel guilty for indulging in a little shut-eye. Maybe we feel guilty because we see napping as weakness. Maybe we feel guilty napping because there is so much to be done… how could we be so selfish as to take a nap? It may be why one person said, “Taking naps sounds so childish. I prefer to call them ‘horizontal life pauses.’” Whatever you got to do, right? We forty percenters have our reasons for the guilt, I suppose. But the sixty percenters remind us how great naps can be! Our staff was swapping ‘nap memes’ this week for fun as we broke open this conversation at our staff meeting. One said, “Yeah, there’s a nap for that.” Naps are the original life hack. Sad? There’s a nap for that. Tired? There’s a nap for that. Angry? There’s a nap for that. Isn’t that true? There was an American business man who went on vacation to another country and came across a local fisherman who was unloading his fishing boat. “How long it take you to catch those fish?” the businessman inquired? “Only a little while,” the fisherman said. The American was incredulous. “Why don’t you stay out longer and catch more? Plenty of day left!” Fisherman said he could but didn’t see the point. He said, “I sleep late, fish a little, play with my children, and in the afternoon take a siesta with my wife Maria. I have a full life.” The businessman tried to lay out for him a business plan on a napkin, showing him how if he caught more fish he could expand the business, buy more boats, hire other fishermen, eventually make millions. “Millions?” the fisherman asked, “Then what?” The American replied, “That’s the best part. You could retire. Sleep late, fish a little, play with your kids, and take siestas with your wife.” Does that sound about right? We are culturally driven to push and push and push ourselves and then push a little more regardless of any cost to our bodies and our spirits. And I’m not arguing for a poor work ethic here. I’m just acknowledging that when our bodies are not synced well with our spirits, both will suffer. It may be why the most appropriate meme of the morning was also shared by our staff team. 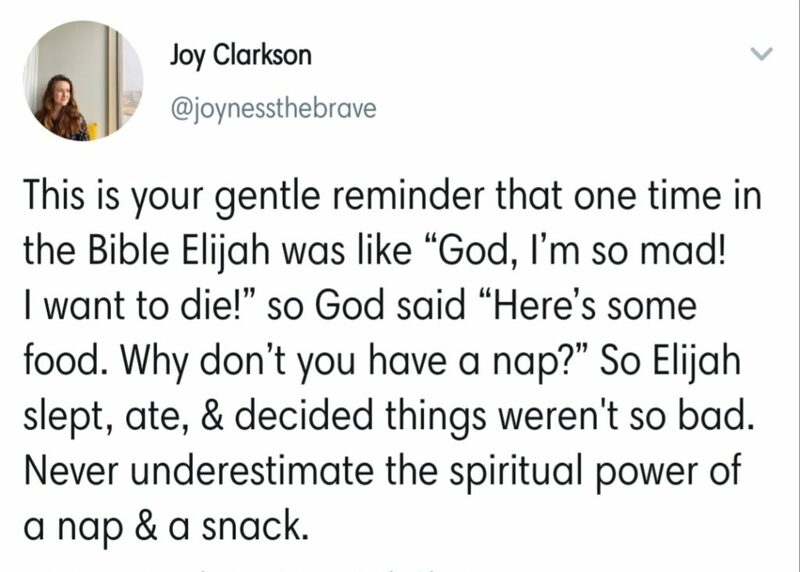 Never underestimate the spiritual power of a nap and a snack. This is the very passage we ponder this morning as we’re about midway through our Lenten series entitled Sacred Rhythms, inspired by Ruth Haley Barton’s book by the same title. Today? Flesh-and-blood spirituality – the consideration of our bodies as holy vessels that carry some very unique essence of the character of God. Elijah was certainly one of those very unique humans – a prophet celebrated by Christians, Jews, and Muslims alike. “He’s kind of a big deal,” as some are prone to say. He shows up in the Hebrew Bible – what we generally call the Old Testament or First Testament – in the book of 1st Kings. Now, 1st Kings represents a forever struggle that is as rampant today as it was back then. This idea of sovereignty – of authority, power, control – theologians have wrestled with it for years – “Is God in total control? Does free will alter sovereignty? Are we partners? Do we have agency or is it all pre-destined anyway and makes no matter what we do?” Plenty of arguments over coffee tables and dinner tables and boardroom tables and even communion tables. God’s sovereignty is one of the most difficult things for people of faith to live out in everyday routines. From our personal daily affairs to the direction of the cosmos – how do we trust that God not only ‘is’ but also is leading us somewhere? A couple of authors (among other things), Don Miller and Bob Goff were hosting a leader’s retreat. It was sort of loosely scheduled to the point that on the second day, Bob asked, Don, “What are we doing next?” Bob’s a total Seven on the Enneagram for any of our Enneagram Class students out there – always up for the next adventure – who needs a schedule, right? What fun is that? But Don answers his question saying, “Oh, I thought we’d just let them have 3-4 hours of free time.” Bob says, “Don… people want to be led somewhere.” So they decided to load up the group on a boat and ride out to this majestic waterfall and asked some leading questions given their setting and it blew them all away. Just a little guidance. A little leadership. While there’s a place for downtime and all of that… when it comes to our faith… don’t we want to be led somewhere? Herein lies the struggle. Who do we trust to lead? God? Or the rest of us? And how… do… we… know what’s what? Elijah was down for this battle over God’s sovereignty and the others being raised as opposing gods themselves. So in this book of Kings, we have God processing a way through, carrying out life through some of the most unlikely and uncooperative people who have ever lived. If nothing else, this should give us some hope today as well. Elijah enters the picture a couple of chapters ahead of our text for today. Not much fanfare in the introduction. One version simply says, “And then this happened: Elijah the Tishbite, from among the settlers of Gilead, confronted Ahab…” and he drops a prophecy about a long drought coming. How would you like your introduction for all of history to be, “And then this happened…” What happens next is some amazing moments of miracles and healing and survival and Elijah coming to a place of battle against the opposing communities who worshiped Baal – not the Hebrew God, Yahweh. You may have heard this story of the great test – Elijah on his own versus huge group of Baal followers. The contest? Whose God would respond to the call for fire? Again – we don’t seem to do all that well talking to each other – we’d just rather have winner-take-all contests. So here we go; the my-God-can-beat-up-your-God contest. The short of it? The Baal prophets try first and no matter what they try, they can’t call down fire on their sacrificial ox. Elijah, feeling confident, has his altar all fixed up and drenched with water… water logging the whole thing for the powerful effect. He does a few card tricks to entertain the crowd while the people were drenching his wood pile. And then it was time and he prayed that God might show up in a big way and the whole thing erupts in flames and the crowd goes wild! But, being upstaged, the opponents were ready to fight now and its this huge massacre and Elijah “wins” if you want to call it that and he gets out of Dodge knowing he’s now a wanted man and will most likely be hunted down and killed. This finally leads us to the nap and snacks. Elijah has been on the run. His adrenaline has crashed, and he’s exhausted and, to be honest, he’s just tired of it all. He feels alone. Nobody else cares. Everybody else quit the committee and he’s been left doing all the work. Do you know this frustration? So Elijah finds a broom tree. 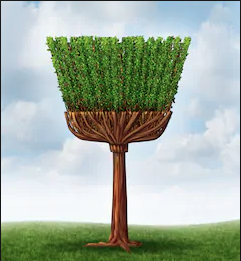 We wondered at staff meeting what a broom tree looks like. This is what we found first. Then, this. 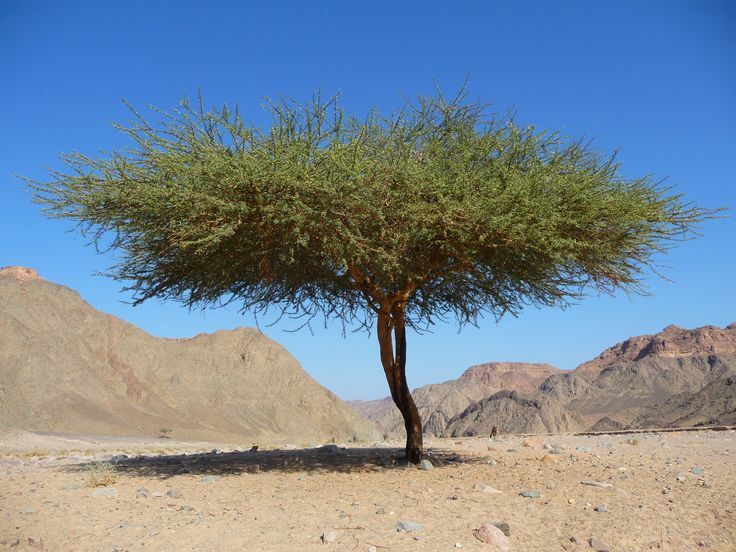 The text says, “a solitary broom tree.” He’s the last lonely prophet and so his greatest affinity is this lonely, solitary broom tree. Elijah is just going off: “God, kill me now. I’m done.” We all have surely felt this way… and often when our bodies are exhausted… it’s why Sabbath keeping and care of our bodies and rest are not just “good ideas,” they are essential to our wellbeing. Our spirits will not be well if we can’t do our best to care for our bodies. Now… I know our bodies betray us sometimes… from no doing of our own, we are stricken with disease or injury and we have struggles that are out of our power to heal. It’s part of the amazing mystery that is our flesh and bones. How are these fleshy suits somehow vessels where God’s spirit is planted to do some meaningful work? And why is it that we are so abusive and hateful to our own bodies and the bodies of others? We reach moments where we have claimed that male bodies are more important than female bodies or straight bodies are more important than gay bodies or white bodies are more important than bodies of a deeper hue. Ozola Hughes, grandmother of a ministerial colleague of mine, died this week – “98 years young,” she said. My friend posted a picture of her Gigi’ beautifully brown hands. I couldn’t help but think of what those hands and her very body have experienced in the last 98 years. A black woman, born in 1921, raised in the South, without the same rights as others because of her body. 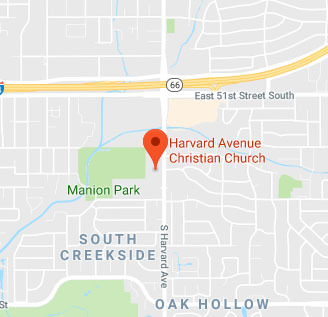 And yet… this Spirit that expressed through her granddaughter – whose black body leads a multi-racial Disciples church in Dallas – says, “We are happy to wait on the Lord…” as she affirms the word of the prophet Isaiah. How do we exist well, at home even, in our bodies, friends? The Christian practice of honoring our bodies (even when we must claim the sin of our history and our present of not honoring everyone’s bodies) is born of the confidence that our bodies are made in the image of God’s own goodness – in diverse and marvelous ways. And if this is so, caring for our bodies is indeed a spiritual practice. This scene is truly the inspiration of the Snickers commercials about people being desperately grumpy when they’re hangry. “I want to die!” he shouts, and an angel shows up and says, “Eat this and take a nap.” The result when his body gets some rest and nourishment? His perspective changes. The angel of God essentially says, “Take care of your body… you’ve got a long journey ahead of you and you won’t make it otherwise.” Interesting enough, it wasn’t until he attended to his body that he was able to hear what God wanted of him. In our own ways, we need to move from ignoring or despising our bodies and allow them to become an ally in the reorientation of our internal and external lives. We seem to be more able to trick our minds for a while… but our bodies tend to not let us slide by without consequence. Wholeness is our congregational star word this year. God created us for wholeness. That spiritual wholeness includes collaboration with our bodies. Feel your body… how does it want you to pray? How is it leading you to serve? How does it call you to connect with your spirit? Our bodies are beautiful in their being and their purpose. It is our bodies that allowed us to be the Body of Christ all over this city yesterday as we served in a congregational day of service called, “In Christ’s Name.” Our bodies allowed us to embody hope and move about… from Pastor’s Class students and their elder Faith Partners to families and Sunday School classes putting together Street Survival kits, detailing the Family Promise Van, church kitchen deep cleans and engaging partner ministries in the city. That is embodied prayer. At some point, we move beyond the vanity of our bodies to the glory of our bodies. Look. Bodies climb cliffs and dunk basketballs. Bodies move paint brushes and write poems. Bodies run marathons and embrace friends. Bodies lend a helping hand and wipe tears of loved ones. Bodies help strangers across the street and stir ingredients to make wedding cakes. Bodies are baptized in water and deliver babies. Bodies even breathe into other bodies that aren’t breathing and that breathless body breathes again. At some point, we come to know that we all have bodies – unique and beautiful and colorful – and despite any difference we see in our bodies, we are, as one writer said, “equally naked underneath our clothes.” That may not feel like a whole lot of knowing but even this little bit of honesty and vulnerability gives us a strange, peaceful, kinship. Every body needs rest and nutrition, exercise and connection and… as we learn from Elijah… every body needs all of that in order to best hear what God has to say to us. So… love your vessel. Have a little grace for your vessel and the vessels of others; take a nap and have a snack… God is waiting for a word with you. From the introduction to 1st King’s as found in The Message. Eugene Peterson. NavPress. 2002. 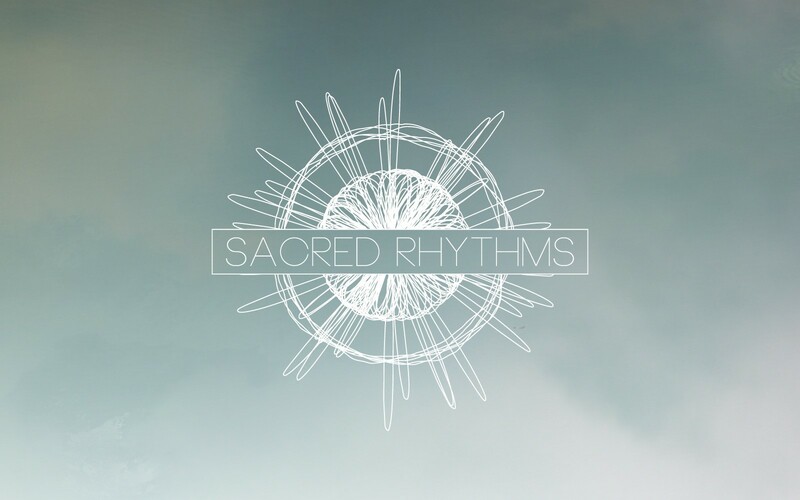 Sacred Rhythms. Ruth Haley Barton. IVP Books. 2006. Her influence is evident in this message as well as in the formation of the entire series. From “Falling Upward: A Spirituality for the Two Halves of Life.” Richard Rohr. Jossey-Bass Publishing. San Francisco. 2011.